The Dorrance Mansion, in the Bristol Historic District, is one of the grandest homes along Radcliffe Street in Bristol Borough, Bucks County. Finished in 1863, it is a distinctive example of residential Italianate architecture and the only example in the borough. Its elegant style represents the lavish life of the early Victorian industrialists making Bristol their home. The brick mansion is erected on a random coursed fieldstone foundation at river level. The five-story center tower on the rear facade adds a distinctive feature to the house. The home remains nearly unchanged since its construction, with a symmetrical front facade and proportionally decreasing windows on the upper floors, creating the illusion of greater height. John Dorrance, Sr., owner of Bristol Mills, built the mansion while living across the street. Dorrance was active in local commerce, improvement projects, and borough government from 1835 to 1860. Dorrance came to Bristol in the 1820s and purchased an interest in the Bristol Mills which dated back to 1701. He eventually bought out his partners to become sole owner. Prior to the Civil War, the mill supplied large amounts of corn meal to the South and the West Indies. When Dorrance's sons sold the mill, following his death, the property was comprised of grist and saw mills, a lumber yard, canal stables, coal sheds, a blacksmith shop, a store, two dwellings and a mill race and pond. Although Dorrance built the mansion toward the end of his illustrious career and only lived there for six years before his death, it is the one extant building with the closest association with him and his business career. 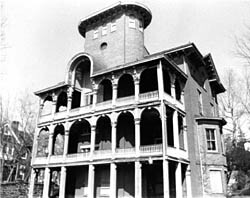 After his death in 1869, the home remained in the family until 1921 when it was acquired by the Bristol Knights of Columbus. In 1982, it became a private residence again. 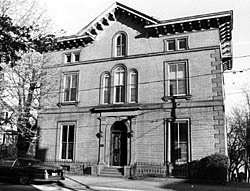 The Dorrance Mansion is located at 300 Radcliffe St., in Bristol. The Dorrance Mansion is not open to the public.